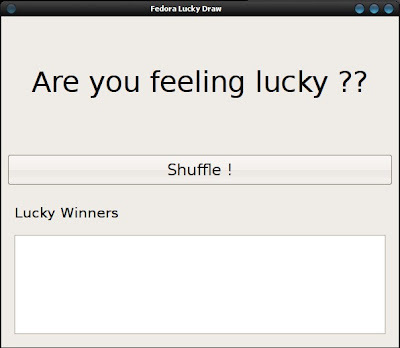 The lucky draw for t-shirt and pendrive distribution for Fedora 10 Release Party was done using a software. It's a mere ~100 lines of code written in Python using wxWidget. The participants' name is kept in a file participants.txt with one name per line. Get the original code from here (a total hack but it works :)). It was further modified by Ankur for use in the event. Last Tuesday (Nov, 25th) marked the release of yet another edition of Fedora (v10, Cambridge) and today we gathered at IOE, Pulchowk Campus to celebrate the Release party. We had several events to mark the celebration. Apart from the introductory and 'formal' stuffs, we had a race (yup, a real one), lucky draw for Fedora t-shirts and pendrives (which fortunately I didn't win, that obviously would be against nature's will) and a candlelight display of Fedora logo. It was awesome! Although Ubuntu is the distro of my choice nowadays, I was a loyal Fedora user from the very first to the sixth edition. The one thing that still fascinates me about Fedora is the incredible and vibrant artwork it has. Provided a good marketing and more easier installation methods (like wubi), I believe Fedora has the potential to be the ultimate killer-distro! Sometimes you might have to merge two or more pdf files into one single pdf document. While there are commercial softwares like Adobe Acrobat or something similar to do the job, it's much simpler in Linux using commandline. There are several softwares for the job and most of them require simple one line command! The following commands merge first.pdf and second.pdf to merge.pdf. You can also merge more than two files using similar command. Ghostscript is a PostScript and PDF language interpreter and previewer. You can do quite handful tasks related to ps and pdf files with Ghostscript; merging happens to be one of them. ImageMagick is basically an image manipulation software but it also handles pdf files. If PDF is electronic paper, then pdftk is an electronic staple-remover, hole-punch, binder, secret-decoder-ring, and X-Ray-glasses. Pdftk is a command-line tool for doing everyday things with PDF documents. pdf2ps and ps2pdf comes with Ghostscript. The former converts pdf file to ps and latter the reverse. We can use them to first convert pdf files to ps format, merge all ps files and then converting ps file back to pdf. 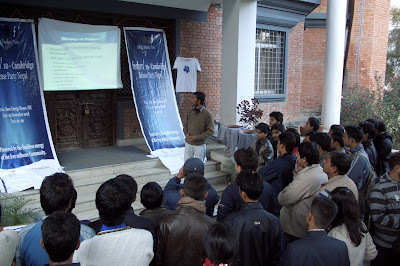 FOSS Nepal has won Software Freedom Day 2008 Best Event Award among over 500 teams in almost 90 countries for second consecutive year. Congratulations and hats off to all FOSS enthusiasts who made this possible. Also, kudos to Bibek for such a wonderful report. The winning entries were selected for the scope of their SFD activities, the number of people reached (particularly from the wider, non-technical community) and the quality of the reporting. The other winning teams were SFD Nicaragua and DabaweGNU. Although this time SFD was celebrated with much less preparation, we had an incredible event. We had a FOSS Awareness Rally, Candlelight vigil and SFD main event. Hope this award will bring even more enthusiasm to the FOSS movement in Nepal. Computer trouble? Try pulling the plug! Three people had carpool: a mechanical engineer, a electrical engineer and a Computer engineer. But the car suddenly broke down. Mechanical engineer said: "Hey! It has to be the fuel injection. Lemme fix it." The electrical engineer didn't agree: "It's magneto probably. I'll fix it." Computer Engineer shoke his head and said: "Hey guys, I have a simpler idea: Let's just close all the windows, get out of the car, then get back into it, and it should run!" Well, it's very common to turn your computer off and on (or restart) if you ever encounter any problem. But don't you think that's the traditional method?? Better try pulling the plug while computer is ON!!! You think I'm joking?? I have two situations where this always works.. This happens time to time in my PC's Linux installation. The CPU is almost exploding at 90% load and it turns out that it's kacpid process eating all the CPU. Passing the kernel option to turn off the acpi altogether solves the problem, but it also turns off the hyperthreading. After a lot of googling, this came up..
After booting windows when boot linux kacpid starts, to stop it just cut the power supply to your PC including UPS if any , without shutting down (obviously after saving data) when linux desktop is active. yes i am saying that take the power cord out. Yup, when you hear the fan shouting too loud, just pull the plug! .. Don't laugh but it turns out that somehow the power plug came loose (I had a fan plugged into the cd prongs and then the power supply plugged in behind it.) so I took it out and plugged the power supply directly into it and viola. Yup, pull off the plug again!! Reminds me of this 'Magic' with MIT AI Lab's PDP-10. Computers are crazy machines. Seems like I'm one of few lucky ones (atleast for few hours/days to come perhaps). 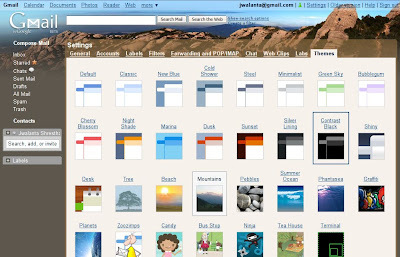 I'm getting Themes Tab under Gmail Settings and they are awesome. Currently I'm using Mountain Theme with Kathmandu as location. Sweet! No more boring standard Gmail interface.. finally! 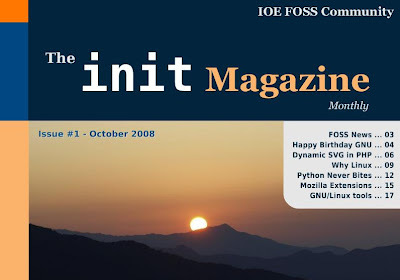 The second issue of The init Magazine has been released. Finally i managed to gather some guts to deactivate my Facebook account. I'm most of the time infront of computer and internet is always on and I cant resist checking out the stuffs that happens there.. Not exactly a 'Facebook addict' (I've seen extremes) but it sure was wasting a lot of my time. It's been more than a week now and I'm feeling much productive now. However, I'm much of a Twitter user now. It's simple, short and is really effective. Aint a time waster like Facebook too. But Facebook Deactivation aint permanent though, I'll be back on it if I get less busy. Facebook was good for killing time when I was hell free some time back. Prajwal and Mahesh have published the journal of our Muktinath - Thorang Pass Trek in D2's blog site EverestUncensored along with all the photos. Have a look..
PS: My Flickr gallery of the trek is here. Change the value of idle_dim_time. It's in seconds, 60 seems to be reasonable. BTW, gconf-editor is like regedit in Windows. A lot of system tweakings can be done through this. 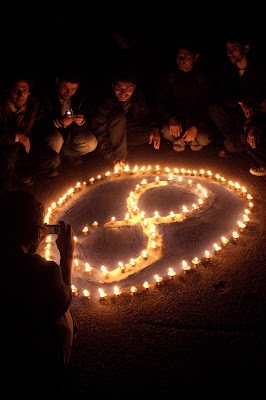 Last Monday we celebrated the release party of Ubuntu 8.10 (Intrepid Ibex) at IOE, Pulchowk Campus. Although the most of the participants were from Pulchowk Campus itself, the program was fun in overall. We even had a candlelight vigil and lucky draw. Release party as good as the new version of Ubuntu! Details of the party here. Photos: Shankar's Gallery. Lately I've been watching some of the best movies Hollywood has offered and I've missed to watch. It's not like I'm watching movies all the time, but I've been digging the Oscar winners and Best-Movies lists and taking out time to watch the best listed ones. Here are some of them (with no particular order, they all are the best in their respective genre). This movie is in five languages. English, Japanese, Japanese Sign Language, Mexican and Arabic. Story of different lives connected together. This one finally gave Martin Scorsese an Oscar. Perhaps one of the best in its genre (crime-thiller). Sean Penn is my fav and I love non-chronologically edited movies. And now I wonder how did I miss this one.. I also didnt know this movie is from the same director (Alejandro González Iñárritu) who directed Babel too and is a part of his 'Death Trilogy'. They say we all lose 21 grams... at the exact moment of our death. Everyone. And how much fits into 21 grams? How much is lost when do we lose 21 grams? How much goes with them? How much is gained? How much is gained? This one is classic. But I still feel like they shouldn't have married. Kundan had recommended this movie to me long time back saying this is perhaps the most accurate portrayal of America. Donno if it's true, but if it is, America is a horrible place to live.. This movie is straight on to my all time favorite list. Didnt know it's based on an award winning novel of the same name by Khaled Hosseini (should have read the novel first). But still it's a brilliant movie and the cinematography of kite flyings are simply breathtaking! If i had to choose the best one from all the movies i have mentioned, i'd choose this one. For you, a thousand times over! Few days ago, for no implicit reason my GNOME installation refused to start. Failsafe mode worked but normal login would throw me back to login screen. Online forums recommended me to check my session scripts and all. But lazy me, i did the following in the terminal. What i did was recovered the skel(eton) home folder files and it worked! I lost few settings related to Compiz but rest were all in place. Last week I went to the trek of my lifetime, the Muktinath Trek. It was the first time I trekked beyond green mountains towards the Himalayas and I was startled to witness the wonderful world out there. It's no green but is full of colorful vegetation. Red, yellow, and orange trees, the barren mountains and Himalayas you can almost touch. If you wanna see Nepal, don't miss this. Check out my Flickr Photo Set. I was in such a rush that i even didn't get time to blog about the release. 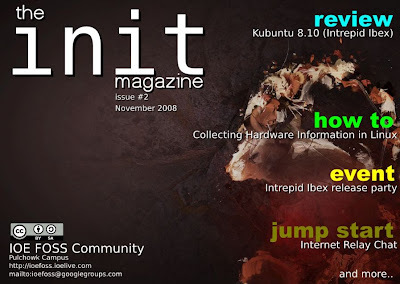 Well, if you (still) haven't grabbed the first issue of The init Magazine, get it (and upcoming issues) from here. Scribus was used for layout designs, and i must say that this software really rocks. Although not as fast as its proprietary counterparts like Adobe Pagemaker, this one is really stable. I never encountered a single crash while designing the whole thing (Pagemaker crashes like hell). If only this software gets little responsive, I'd be recommending it to everybody. The next issue will be out on 15th of November, so keep tuning..